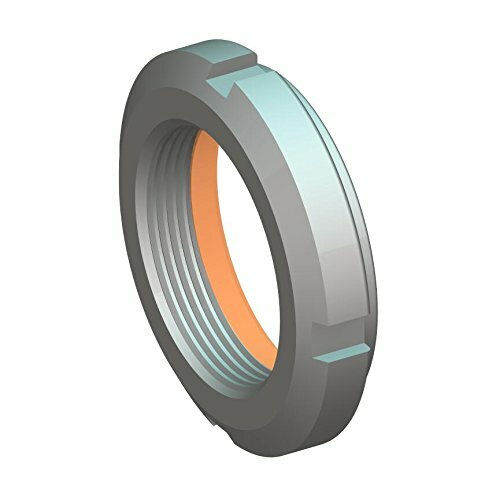 Whittet-Higgins one-piece Bearhug prevailing torque locknuts function through the use of a pre-threaded, inter-molded, heat stabilized, polymer locking collar. This locking collar is precisely cut and formed to create a specific functional interference fit when threaded onto the shaft or spindle thread. When assembling onto a shaft thread, a higher torque value is required as the polymer collar is deformed and compressed. This elevated force prevents the retaining nut from loosening and prevents the full power transmission assembly from becoming loose during operation. Engineering support and CAD drawing models available at manufacturer's website. View More In Bearing Nuts. If you have any questions about this product by Whittet-Higgins Company, contact us by completing and submitting the form below. If you are looking for a specif part number, please include it with your message.